As expected, the Board approved the following motion. This is something that has been tried in other parts of the country — it remains to be seen how much it impacts voter turnout, although I think it certainly can’t hurt. Find your polling place here. You can plan transit trips on metro.net or, if you prefer, Google Maps or the Apple Maps app on Apple devices. Metro Bike Share is also offering free rides on Election Day. The skinny: Use promo code 1162018 at any station kiosk to get a free ride on us. Promo code good for one Single Ride. First 30 minutes are free and $1.75 per 30 minutes thereafter. 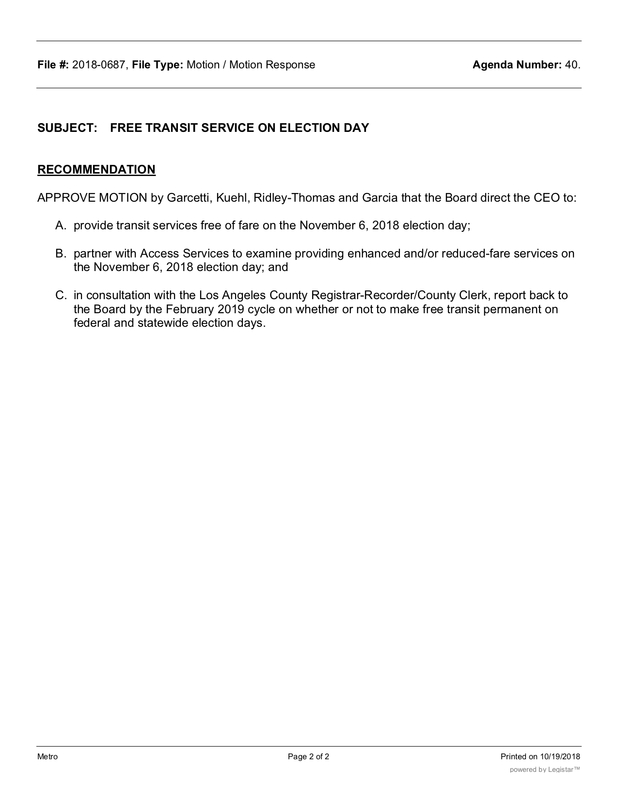 The Los Angeles County Metropolitan Transportation Authority’s (Metro) Board of Directors today approved providing free rides on Election Day, November 6, on all Metro buses and trains. 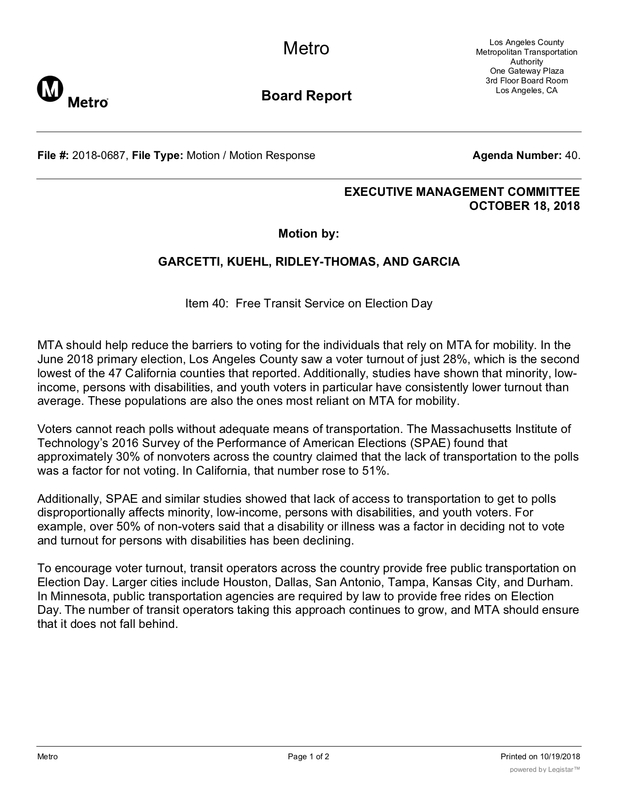 Los Angeles Mayor and Metro Board Second Vice Chair Eric Garcetti co-authored the free rides on election day motion along with Board Chair Kuehl, Supervisor Mark Ridley-Thomas and Long Beach Mayor Robert Garcia. Recent studies have shown that a lack of transportation is one factor for people who do not vote. The lack of access to transportation disproportionately impacts minority voters, people with low incomes, persons with disabilities and younger voters. Will TAP cards be required on the rail system (or to open turnstyles)? Will “proof of fare” be required? Will it be checked? Will proof of intent to vote (or completion) be required? Does this end when the polls close (or a set time thereafter)? Does this include those that are not of voting age? How about those that can’t legally vote? We’ll have more details and specifics next week once we confirm with operations staff. No, you won’t need a TAP card to board Metro on Election Day, although you may need one to transfer if you are also using other agencies. Is it known whether other transit agencies in L.A. County are going to follow suit? Yes, many other agencies will also be offering free rides, we’re compiling the list and will have an updated post next week. Thanks! When is the “CEO” ever going to “Go Metro?” Never seen him once board a bus or stand in an crowded train. When we had Mr. Leahy, I had the pleasure of riding with him a few times on the Gold Line. Mr. Washington you should come out and actually meet your riders, meet your operators, meet everyone on the frontline. Everyone out on the road and behind the scenes deserve much more credit than what is given. And you have failed miserably on that. Show that LA has a top transportation agency, by being out there in front of it all. Not just behind the camera, or behind the desk. One week of riding the rails, riding the buses won’t hurt you, and if you’re that afraid, then you my friend have no where to be telling people to Go Metro, nor have a place as Metro’s CEO. Phil’s a regular rider, as is/was Art during his time at Metro and now Metrolink. I do think we can always do a better job in Public Relations of highlighting the many folks behind the scenes at Metro. My colleague Anna Chen has posted a number of Instagram stories on different divisions (you can follow us at @metrolosangeles on IG) and we’re presently working on a video about Rail Fleet Services and some of the folks that the trains rolling. Nonetheless, your point is well taken and always feel free to drop me a line with any potential story ideas (hymons@metro.net). I know City of Commerce bus’s will be free on election day. Of course, they are free everyday. To me, this may be good PR, but to get to a polling place from where you live most likely will be a short walk, and if you drive a short drive. I doubt in reality this will help most all voters. Even before ROV fixed the place to vote, that is I had to go pass one voting location to my assigned location, and even there, half way between the two was a Metro Bus Stop. I guess I could get on, then before the bus leaves, get off. People will complain about anything!